See when it comes to your house, things can really get messy and time-consuming. But on the other hand, some people find it a lot interesting and they feel so much happy decorating their house in all the possible ways. Moreover, when it is your living room or the bedroom people tend to decorate it very good but kitchens are not so wholeheartedly enjoyed in dressing. But then one should never forget that the kitchen is the most important part of your house. So, if you are tired with the old fashioned dress up that your kitchen is wearing for a long time now then you are at the right place. #1. First of all, if you are painting the walls of your kitchen keep in mind that tiles and dark colors are really not going to work. And this is simply because dark colors don’t suit kitchens and tiles are too outdated. #2. What you can do is give it a light shade, something like off- white or cream. You can also put up some wooden worktops that could light up the environment in your kitchen. It looks good and also gives a positive feeling as you don’t have to find too much in your kitchen. Things are more or less in front of you. #3. Now you can use a modular kitchen set to give your kitchen a facelift. It can give you a lot of ease while working and also get things in a modern fashioned way. 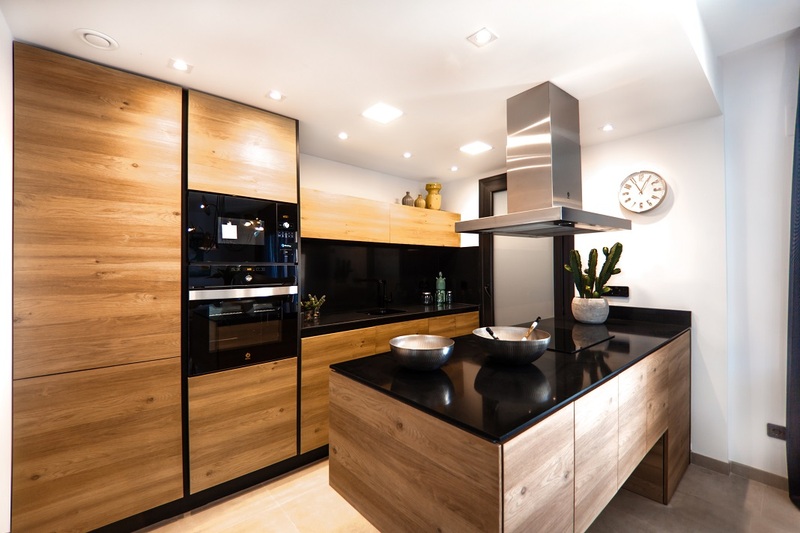 To make it better, you can also go for a renovation and change in the kitchen You can either load a stainless steel sink or a cemented sink according to your wish. #4. The racks are also very important. Sometimes, what people do is just keep their utensils on the shelf of the kitchen which makes it a lot fizzy and not good to eyes. So you can help yourself by organizing it well and making the use of racks of the kitchen. Even if you are not putting the extra racks in use, obviously you can have a lot of other sets of racks that can help things get a well -functioning position. #5. The counter space is what makes or break the deal. See to a lot extend Indians have this habit to keep things in front of their eyes. It happens to be their habit as they think if things are kept on the counterpart, it will be very easy for them to gain the access of all the utensils. But this is not true; if the counter is not cleaned properly and if it is left scattered, then you might get worked up easily. So leave the maximum space you could. #6. Use the technology that has made lives simpler and better. Yes, I am talking about the dishwashers. See there are times when you get so tired or lazy that the kitchen sink is so full of utensils that you might puke it away. So, to not let this time come in your life, it is very good and easy to use Dishwashers. All you need to do is get the utensils in their respective shelves and turn on the switch. #7. You can either mix and match or miss the match in the kitchen. This means that you can either go for some bright and dull colors in accordance with what you would desire them to be, like red color in between and white all over. Or you can go with same old fashioned color schemes that you might find in almost every kitchen in the nation. #8. Space is never an issue, working space is what you should be concerned off. Yes, you heard me right. In a nation, there are various types of house and different types of kitchen. You might find some of them that are too small and some of them that are too big. So, while reading this article you should not compare yours with a bigger one and reject the idea; rather what you should do is, imply them in your kitchen and see the change. So, these are a few kitchen ideas and tips that would keep your house beautiful from all the aspects. Although they might help you in a lot of ways if you still don’t get it in the right position you need a bit more space. But before you declare this, do apply the above tips first and get the result.